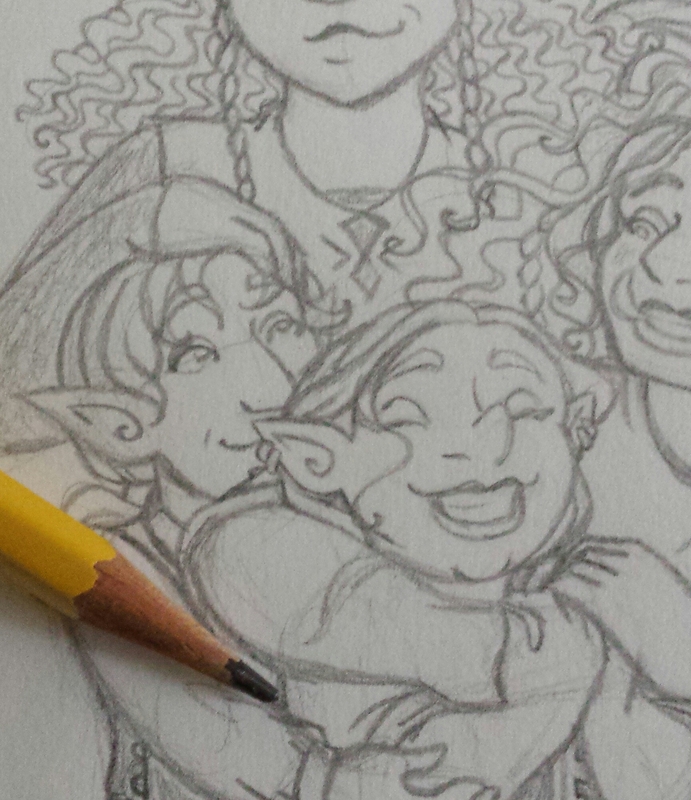 “WIP Wednesday,” that is, with some bonus art progress! I don’t get to show off Tock’s plumpness very much in the comic, due to the fun of corsets (really the only other times we’ve gotten to see it are in “Resurgam” and these two patron bonus pieces, “Tock’s Carwen Altar” and “Moonlight Stroll at the Camp”). But in interest of getting to do that – since the need for me to push the body-positivity of the series has been brought VERY much to my attention lately – I’m redoing an old sketch of her daydreaming. More WIP of this will be available for all patrons on Patreon as I go, btw. And don’t forget about the exclusive print special – only available for 12 more days! Soooooo every month over on Patreon, I do an exclusive drawing for Ranger-level patrons. This is part of this month’s – I liked it so much, I couldn’t help but share a weeeee bit of it! This is not exactly canon – there is no magical door to “Faerie” in Tock’s world – BUT it is heavily inspired by my own service to the Fae and how that effects Tock’s story. I’ve been thinking about that a lot, lately…. Inkwork is complete, and posted in full for Rogue level patrons (with dialogue too) over on Patreon! Yay! This is actually a very simple page, so hopefully color work won’t take too long. Work on every other project I have going on has been pushing longer than I expected, but I do plan in the deepest parts of my heart to get this page finished before the year is over. Getting there 💚 Actually halfway done with the colorwork for the whole page now, but progress will be on hold for the next couple of days as I get ready for an art show! So here’s this in the meantime. Thank you for your patience, readers – I’ll be back to my regular work schedule on Monday. When I say it’s coming along slowly, I do at least mean it IS coming along ^^; Full view of the inkwork is available for Patrons here . All work © Rachel Terwilliger.